Yesterday was my 35th birthday. (sigh) Something about the 5’s for me… little mini-life crises. I had one at 25. It was the oh-my-gosh-what-the-heck-how-am-I-25-already-and-don’t-know-what-I’m-doing-with-my-life-yet kind of breakdown. Now I’m in the midst of whoa-how-am-I-35-and-thought-I-knew-what-I-was-doing-but-now-I’m-questioning kind of deal. It’s cool, it will all work out, God’s got me and there’s nothing to worry about. I’ve never been happier. My husband is incredible– full of integrity, generosity, and muscles (hey, gimme a break, I’m only a woman!) My son is healthy and starting life again…slowly, but he’s starting. My family is just amazing. Not so much my blood-family. Unfortunately it has been blown apart and everyone seems to have gone down their own path. But my family, my peeps, the real people I do life with, those people are incredible. Blood or no blood, they are my family. They are the ones I call when I need something. They are the ones who share my special moments, my tears, and my triumphs. They are the ones who remember the little things that connect my heart to theirs. They are the good in my life. I’m so thankful to have each one of them. Yesterday some of my people conspired to turn a rained-out party into a little birthday gathering for me. We were getting together anyway, there was no doubt. But they went a little extra step and added something special just for me. It was by far the best birthday ever. Every year on my birthday, I used to call my mom and sing “Happy Birthday” to her. She would always laugh and ask me why the heck I did that when it was my birthday. I always used to tell her it was because she was the one who gave birth! It only seemed right. That was a fun little tradition of ours, and that tradition is gone now, along with my momma. This is the first year I couldn’t call to sing the reverse happy birthday song to her. It hit hard. Another thing she used to do, up until the past few years before she died, when she just didn’t really cook at all or do much of anything, was to make me a special birthday cake. 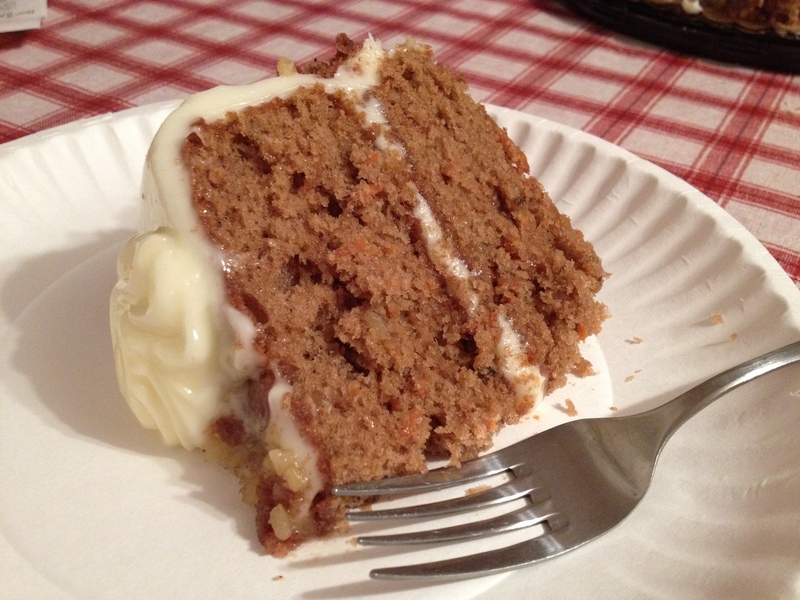 Something unusual, special, just for me…a homemade carrot cake. It had been years since I’d had the special cake on my birthday. Another little tradition, gone. This entry was posted in friendships, thankfulness, the little things. Bookmark the permalink.